Our Canare by HAVEPro handcrafted 110-ohm digital audio snakes are perfect for multiple channel transmission of 110-ohm AES/EBU digital audio data. Made with Canare thin profile, extra flexible precision DA202-8P series digital audio snake cable, Neutrik XLR’s and/or professional quality DB25 connectors. 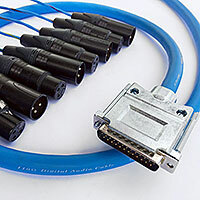 Ideal for multichannel AES breakouts from AD/DA converters, digital mixers, or digital multi-track recorders.